Beginning in 1996, the Double Decker Arts Festival celebrates live music, local food, and handmade crafts. Friday evening and ending Saturday, this festival is free to the public. The 2016 Double Decker Arts Festival is scheduled for Friday, April 22nd and Saturday April 23rd. 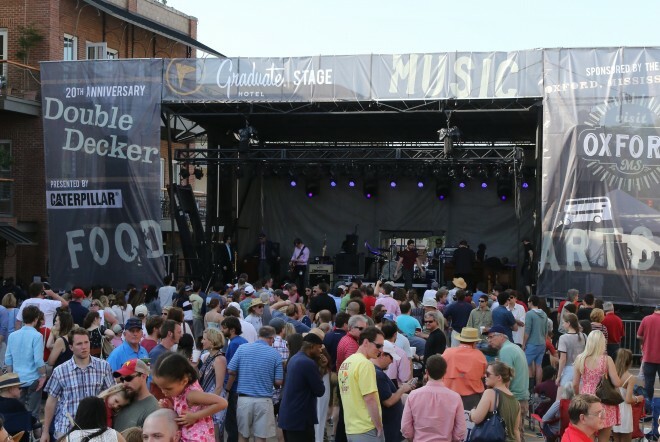 For more information about lodging, directions or general information about the festival contact Visit Oxford at 662-232-2477, www.doubledeckerfestival.com, or leeann@visitoxfordms.com. The Yokna Sculpture Trail, located in Lamar Park, features a rotating exhibit of 18 large-scale sculptures by locally, regionally, and nationally renowned exhibiting artists. This collaboration between the City of Oxford, The University of Mississippi, and the Yoknapatawpha Arts Council is the first outdoor sculpture program of its kind in North Mississippi. A vibrant arts culture and beautiful green spaces are at the heart of what makes the community of Oxford great. The Yoknapatawpha Arts Council works to provide access to the arts that are reflective of the community of Oxford through a diverse offering of artistic, cultural, and educational opportunities. The Yoknapatawpha Arts Council calls the Powerhouse Community Arts Center its home. The historic building used to serve as Oxford’s power plant, and is now a venue for theater and art classes, performances, and community events. Once filled with the hum of machinery generating energy, the building now resonates with the artistic energy of performers and artists. The Powerhouse Community Arts Center is a great place to host a wedding, private party, or corporate retreat. Some of the major events hosted at the Powerhouse Community Arts Center are Secret Show, Fiber Arts Festival, Miss-I-Sippin’, YAC Annual Ornament Auction, 3 Blind Wines, Oxford Art Crawl, and Art-er Limits. Usually held in the spring, Miss-I-Sippin’ features an array of beer and food pairings organized by the University of Mississippi Nutrition and Hospitality Management Department’s Faculty and Students. Mississippi products are used in the recipes made to complement each beer. This event is held at the Powerhouse Community Arts Center, and it benefits the Yoknapatawpha Arts Council and the Department of Nutrition and Hospitality Management. On the 4th Tuesday of every month, the Yoknapatawpha Arts Council organizes an Art Crawl event. This begins at the Powerhouse Community Arts Center on University Avenue where refreshments are provided. The Double Decker bus takes guests over to Southside Gallery on The Square, then to Meek Hall on the University of Mississippi’s campus, and the University Museum. At each of these locations, you are able to enjoy a plethora of art! Square Toast for Scholarships is a walking food and wine tasting event, which is spread across restaurants and retail businesses on the Historic Oxford Square. It will be held on Thursday, November 12th 2015. On the night of the event, the area around the Square transforms into one large, varied restaurant. Event goers check in at the Lyric Theater to receive their wine glass and a map of participating venues. Square Toast for Scholarship is an event produced by the Department of Nutrition and Hospitality Management at the School of Applied Sciences of The University of Mississippi. The Yoknapatawpha Arts Council has launched its newest art gallery, the Art Vending Machine. Housed inside a converted snack machine located at Cups on Jackson Avenue, this new gallery provides low cost, easily accessible art and handmade items. Since 1993, Southside Gallery has been exhibiting the work of fine artists and folk artists from the Southeast. Committed to promoting the arts, new exhibitions are displayed each month, and artists’ receptions hosted by the gallery offer the opportunity for art enthusiasts to visit with some of their favorite artists. The gallery features work by regional, national and international artists, as well as hosting lectures series and receptions. The gallery is also a wonderful venue for private parties, wedding rehearsal dinners, receptions and many other events. Housing an average of 150 events annually, the Gertrude C. Ford Center for the Performing Arts is the premier entertainment venue in Oxford, Mississippi. It is the centerpiece of the University’s cultural and scholarly mission to present the finest in the performing arts and visiting lectures. The Ford Center enriches the intellectual and cultural environment of the University of Mississippi and the region by providing a venue for programming in performing arts, public affairs and the humanities. The Ford Center complements the University’s commitment to excellence in education, research and service while celebrating imagination, innovation and creativity. The University of Mississippi Museum and Historic Houses complex serves as a cultural center for the university community and beyond. The University of Mississippi Museum is dedicated to research, education, documentation, and the presentation of art, science, and history. Among its holdings are Southern folk art, Greek and Roman antiquities, 19th century scientific instruments, and American fine art. Part of the museum complex is the former home of Nobel and Pulitzer-Price winning author, William Faulkner, Rowan Oak, a historic literacy legacy. Rowan Oak was renovated and reopened to the public in 2001 and continues to draw international visitors each year. The Museum also owns the Walton-Young Historic House- once home to critic and satirist Stark Young. Today, the University Museum maintains our founders’ dedication to preserving, interpreting, and exhibiting the art and cultural heritage of Mississippi and of the American South. S & J Art Gallery is the one stop shop art gallery with custom framing, antiques, and one of a kind gifts and local prints. Located at 101 Jackson Avenue, this shop is just off The Historic Downtown Square. Taylor Arts, located just outside of town in Taylor, Mississippi has become a small artists community where the arts scene alone is worth the drive. While you are there, you can also enjoy some catfish at the famous Taylor Grocery. Visit their website (http://www.taylorarts.com/) for directions and hours of operation. For more art exposure in Oxford, please visit our website or give us a call. Thank you to our Summer Intern, Meggie Morgan, for this blog post.